After our two-day visit exploring both the Brazilian and Argentinian side of Iguazu Falls, we wanted to explore more of the sights and sounds of Northern Argentina. 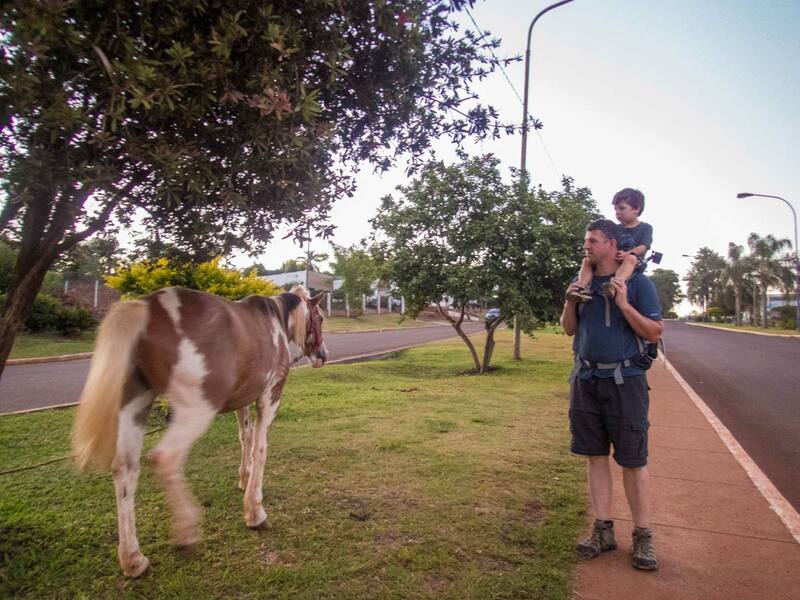 We booked a ride three hours inland to the Misiones Province in Northeastern Argentina to the town of San Ignacio. 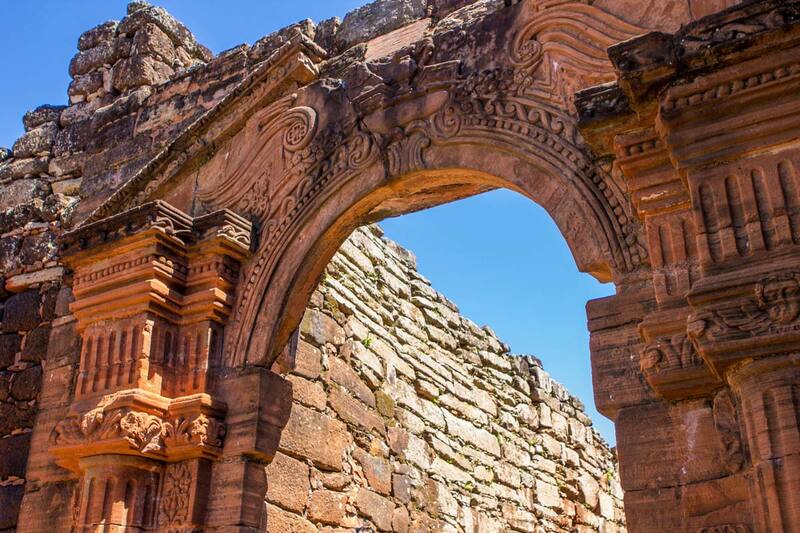 San Ignacio is home to incredible indigenous cultures, as well as some of the most spectacular Jesuit ruins in Argentina such as San Ignacio Mini. This region is often left unexplored by visitors to the country, but a journey here offers a glimpse of Argentinian culture that won’t soon be forgotten. San Ignacio is the perfect place to explore some off-the-beaten-path destinations in Argentina. The town of San Ignacio is located about 56 km northeast of the city of Posadas via RN12. Most visitors to the town explore as a day trip from the much larger regional center of Posadas. We, however, opted to use this small town as our base of operations for exploring the Misiones Province and nearby Paraguay. Staying in San Ignacio reduced our travel time between the various locations by several hours. San Ignacio is a small town. 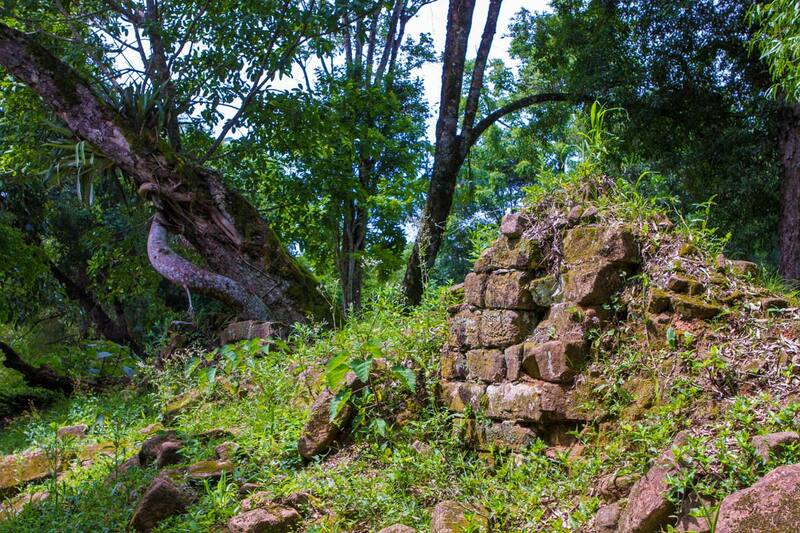 The region is home to about 7,500-8,000 residents mostly focused on agriculture and tourism thanks to the growing fame of the San Ignacio Mini Jesuit ruins. 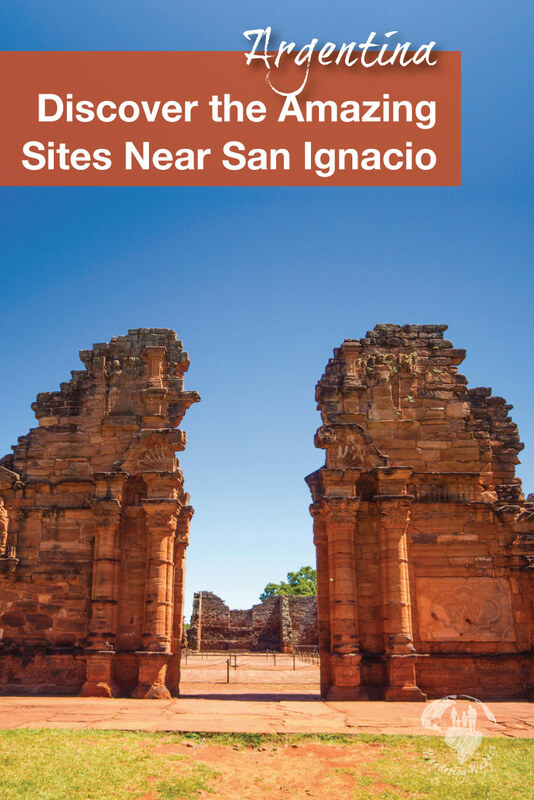 The highlight of any visit to San Ignacio, Argentina is definitely a visit to the San Ignacio Mini Jesuit ruins. These ruins were declared a UNESCO world heritage site back in 1984. The original village of San Ignacio Mini was established in the 1600s by traveling Jesuit Missionaries. The ruins as they stand are considered to be the best-preserved mission ruins in Argentina. The San Ignacio ruins are located near the north-west end of the city. They are strictly controlled by timed entrance and tours. We gathered our tickets at the entrance area off of the road and passed through a museum filled with artifacts and stories of the village and its people. After leaving the museum, we followed the building around, wandering through the shade of tall trees that gave us relief from the hot mid-day sun. This route took us through the village buildings and workshops, which the boys loved exploring. The doors were just the right size for them! We came upon the huge main plaza. The well-manicured grass contrasted with the stunning facade of the remnants of the San Ignacio Mini church. The towering walls were every bit as impressive as we had hoped they would be. After stopping for some photos, we entered the church via the detailed facade. The inside was less detailed, but a few of the arches remained that showed off the talented handiwork that went into the construction. The buildings in the town were made of red sandstone blocks in a style called Guarani baroque. We were surprised to learn that the structures were originally white! The site is easy to navigate on your own with panels explaining the significance of different areas of buildings. We learned about how the aim of the mission was to evangelize the Guarani natives. 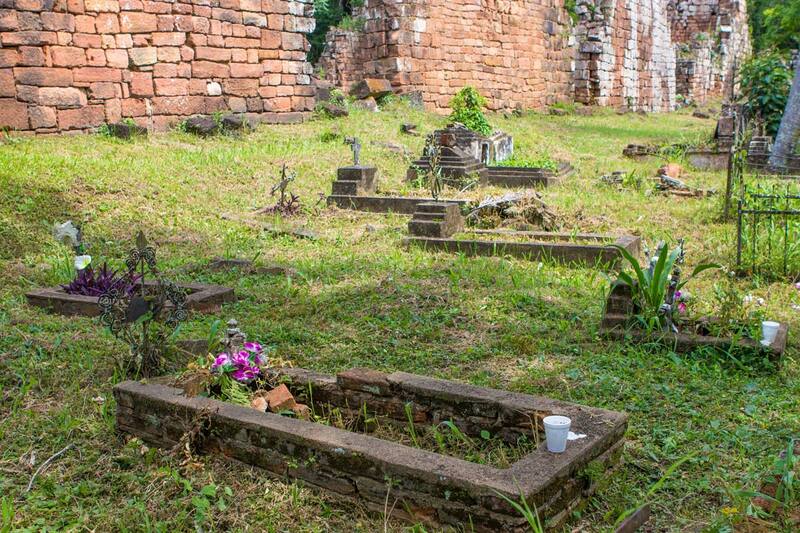 Like the Missions in Paraguay, each mission was led by a single Jesuit Missionary whose job was to strike a fine balance between Guarani culture and the Catholic Diocese. The mission eventually ended when King Charles III of Spain expelled the Jesuit order from the site. 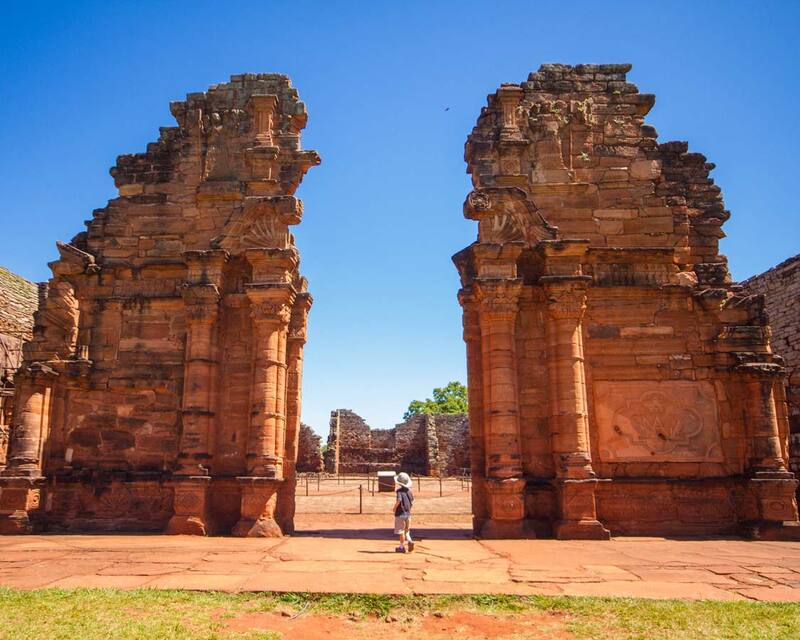 The ruins were later destroyed by local Guarani tribes, although there is a spectacular amount that is left standing, waiting for visitors to explore them. 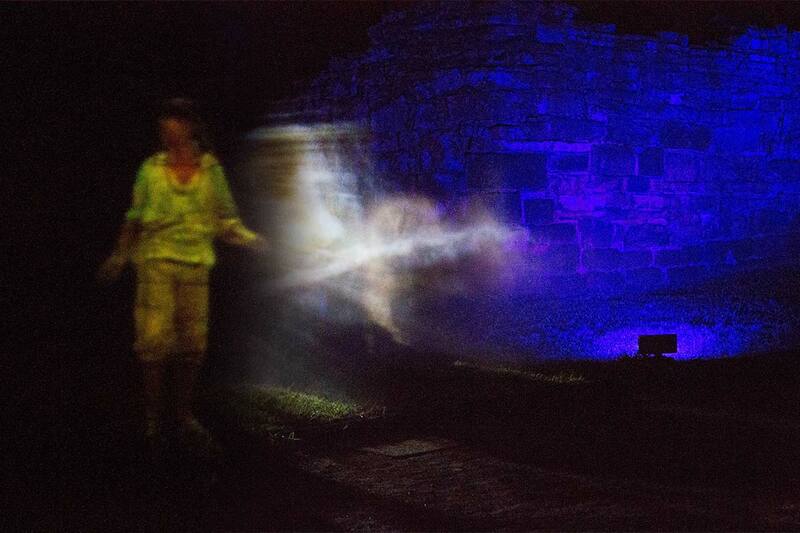 At night the ruins are transformed into a sound and light show. Having experienced Petra by Night when we visited Jordan, we knew we had to go back to experience these ruins at night. The only drawback was that we had to pay another entrance fee. However, this was also the case for Petra by Night in Jordan. The night story experience at San Ignacio Mini provided some insight into the lives of the 4000 Guarani that once lived on the site by using projections cast onto a mist of water spray. The various segments are presented at different parts of the ruins. We were also provided with headsets which relayed the stories in English. The presentation was wonderful and awe-inspiring. The ghostly figures told the story of the locals prior to, and during the uprising that led to the destruction of the ruins. 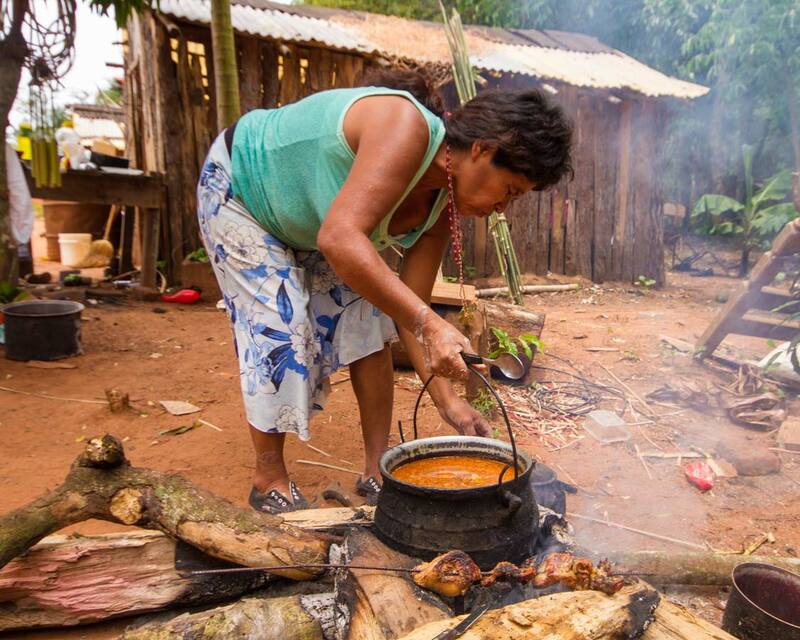 And it truly felt like we were watching the lives of the Guarani people unfold before us. 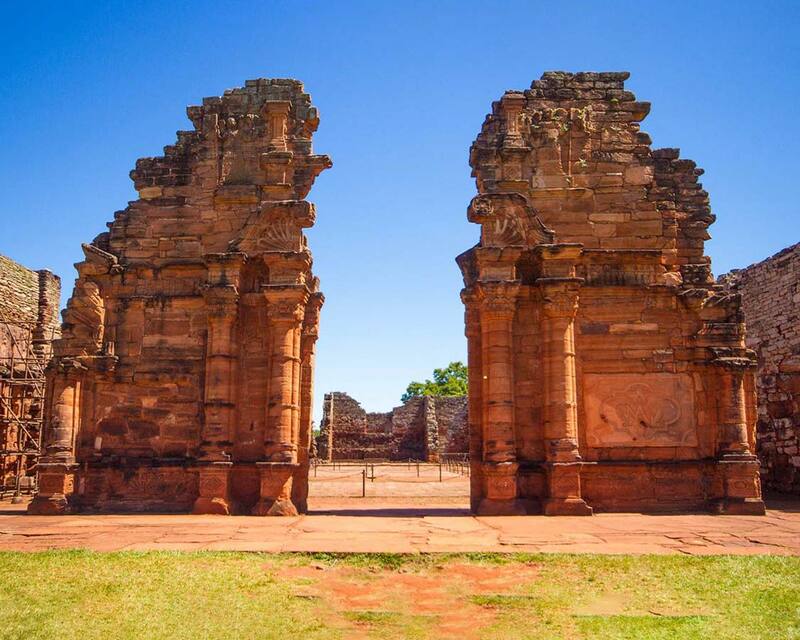 If you have some extra time in Misiones, Argentina, the Jesuit ruins of Santa Ana and Loreto are worth the day trip. Both are also UNESCO world heritage sites and perfect for those looking for family adventure holidays. Best of all, entrance is included as part of your ticket to San Ignacio Mini. 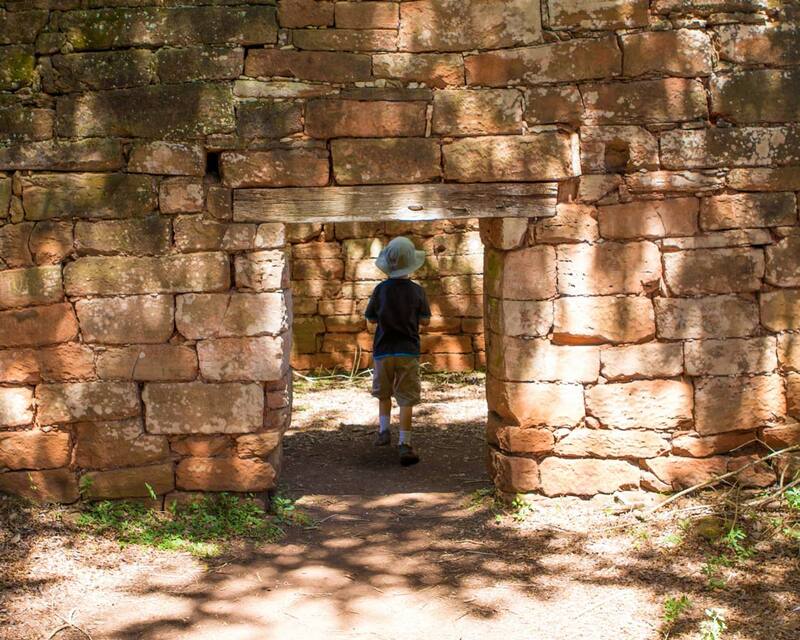 Our first stop was the Santa Ana ruins which are only 2 kilometers from the modern-day town of Santa Ana and about 15 minutes from San Ignacio. Santa Ana was founded in 1633. Our guide told us that over 7000 Guarani once inhabited this town. This was not surprising when we saw the massive 140 sq. m. plaza. 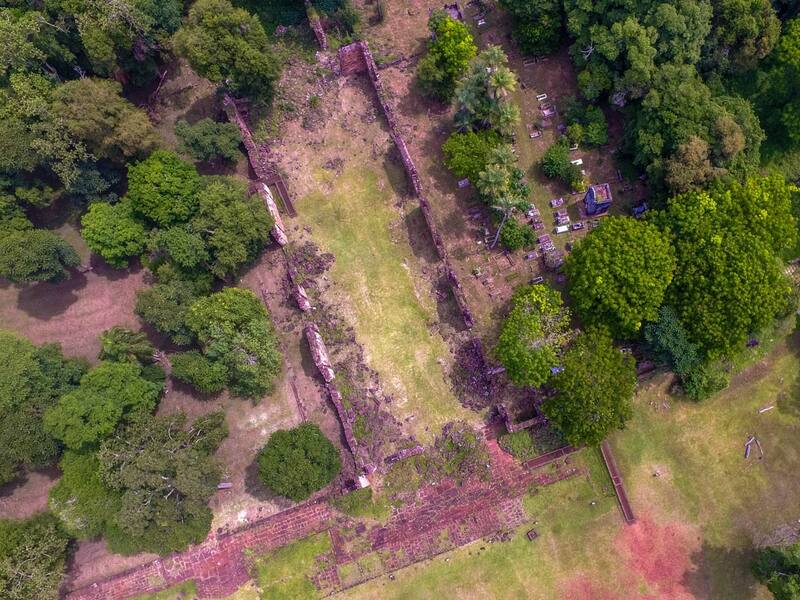 Unlike San Ignacio Mini, the Santa Ana ruins have barely been excavated. Instead, some trees and other foliage have been cleared allowing guests to see foundation stones. The site reminded us of the Coba Ruins in Mexico where the jungle seemed to be taking back the site. We also spent some time at the cemetery which is just to the right side of the church. Many graves had top slabs that had been moved with time. Other larger walk-in tombs had broken doors or windows allowing birds entry. Some graves had fresh flowers while others had obviously not been visited for years. We could have wandered here for hours. Next, we visited the Nuestra Senora de Loreto. Nowhere near being fully restored, it is hard to imagine that it is was the largest of the 3 missions we visited. Nuestra Senora de Loreto was founded in 1610 and abandoned in the mid 1700s. Amazingly, we learned that it was the site of the first printing press in Latin America. The ruins were in various states of excavation at the time of our visit. Many of the newly excavated areas were protected by roofed structures. Boardwalks were set up to explore the excavated area. Wanda Mines is only 40 km away from Puerto Iguazu. So, many tour companies provide a combined day tour of San Ignacio Mini and Wanda Mines from Puerto Iguazu. However, we didn’t want to feel rushed at San Ignacio Mini. And since we were staying in the town for a few days we opted to go on a tour of Wanda mines on a different day. When we showed up for our tour, we were surprised to find small pieces of amethyst on the ground. C was ecstatic. He has taken to collecting rocks from various places during our travels and these rocks looked, in his own words, “more awesome” than other rocks in his collection. Our tour guide greeted us and explained that the Wanda Mines were once a large source of quartz crystals such as amethysts, agates, and topazes. 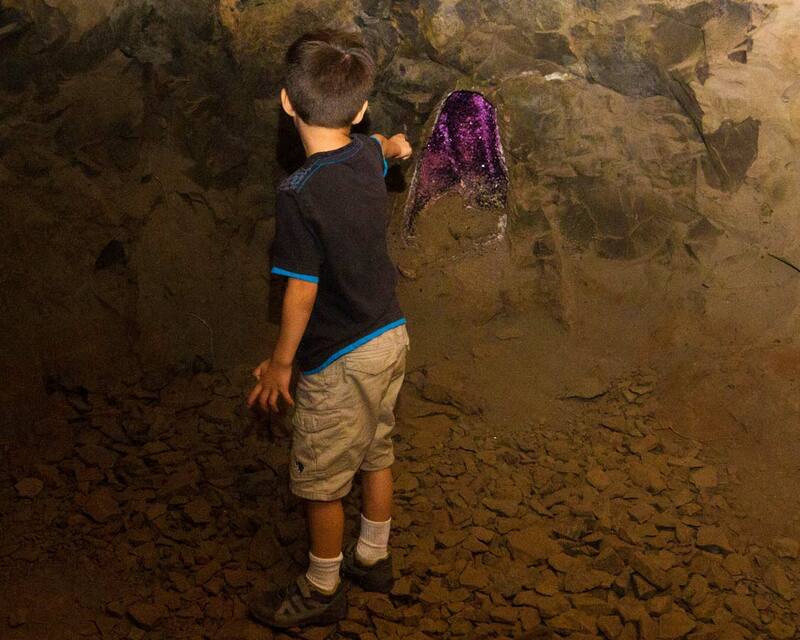 However, nowadays the mine is largely operated as a tourist attraction. 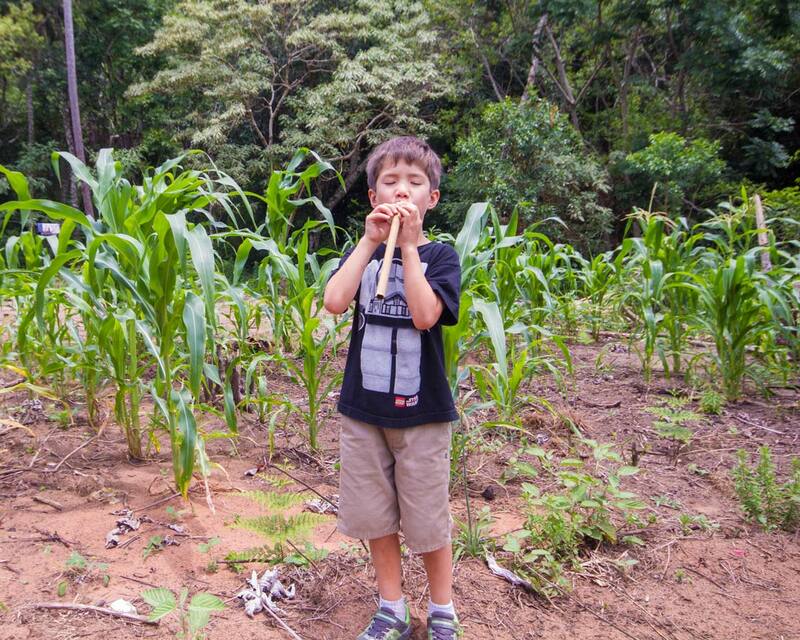 After visiting the Jesuit ruins in the area we had a yearning to learn more about the local Guarani community. Lucky for us, there was a community nearby that allowed visitors. At the start of the tour, we met the community elder who welcomed us to the village and introduced us to our Guarani guide, who also happened to be his son. The tour would lead us through the hunting grounds and agricultural regions of the village. We learned about how the community lives by doing a 2-hour hike in the forests of the village. 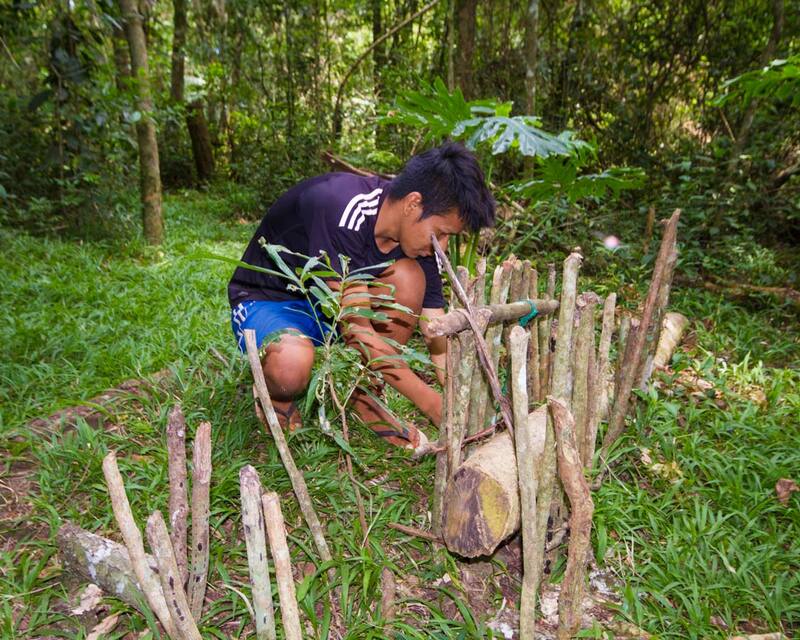 They had set up traps to teach the children about their traditional hunting methods.They taught us how many elders still fish in the traditional way using spears. We also experienced firsthand the various medicinal plants that can be found abundantly in the area. C particularly enjoyed climbing the re-creation treehouse and testing out his own blowdart gun. D, on the other hand, got down and dirty playing on the streets with the local Guarani children while Kevin walked around the village taking photos of everyday life in the community. We stayed at Brizas del Norte in San Ignacio. We booked the hotel directly with the wonderful owner, Michael, who also helped with booking our tours in San Ignacio, Argentina. 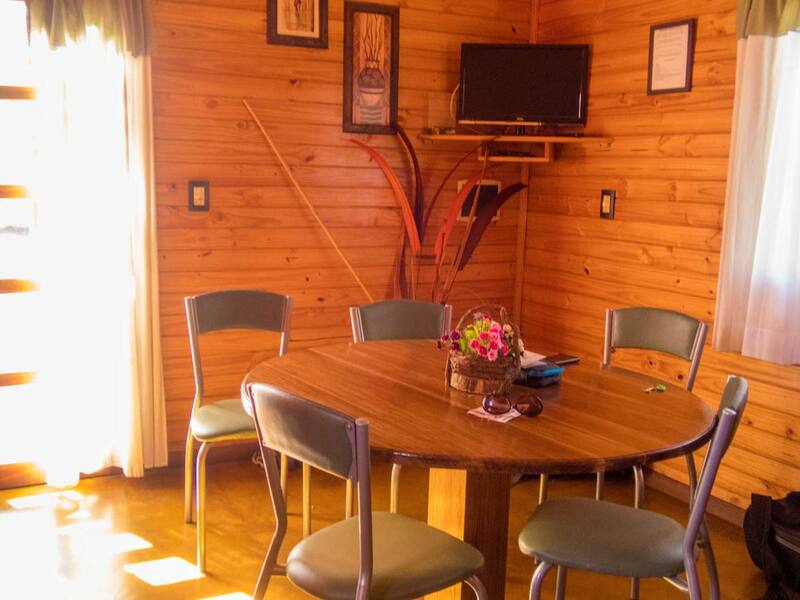 The hotel is made up of 10 individual cabins in a wonderfully landscaped garden. We stayed in the family cottage which had two bedrooms. One bedroom had a queen size bed and the other bedroom had a bunk bed. The beds were comfortable and there was sufficient bedding for the colder months. Since we were visiting during the summer season, we made good use of the air conditioner. The kitchenette was equipped with a fridge, microwave, hot plate, and a kettle. The cupboards were stocked with dishes making it a great place for those that want to cook their own meals. There was a small circular dining table with four chairs. Provisions could be purchased at the convenience stores in town. The living room had a couch which faced the flat screen tv. We cannot comment on the cable selection as we never turned it on. There was an on-site playground that would never have passed any safety standards in North America. Needless to stay, the children thoroughly enjoyed playing on it. 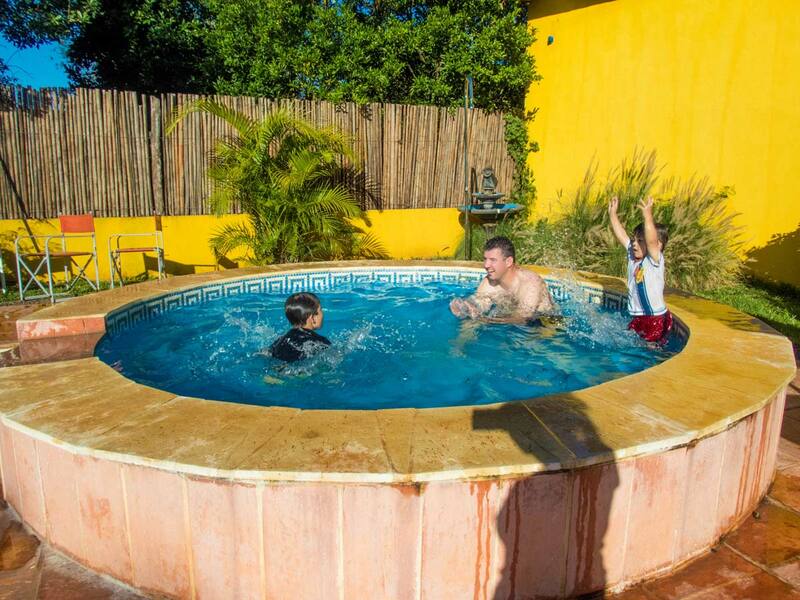 They also loved swimming in the pool and the accompanying small circular section that is perfect for younger children. Both nights we ate dinner at the on-site restaurant. The food was good but we would have much rather had barbeque from the stands that were set-up in town. 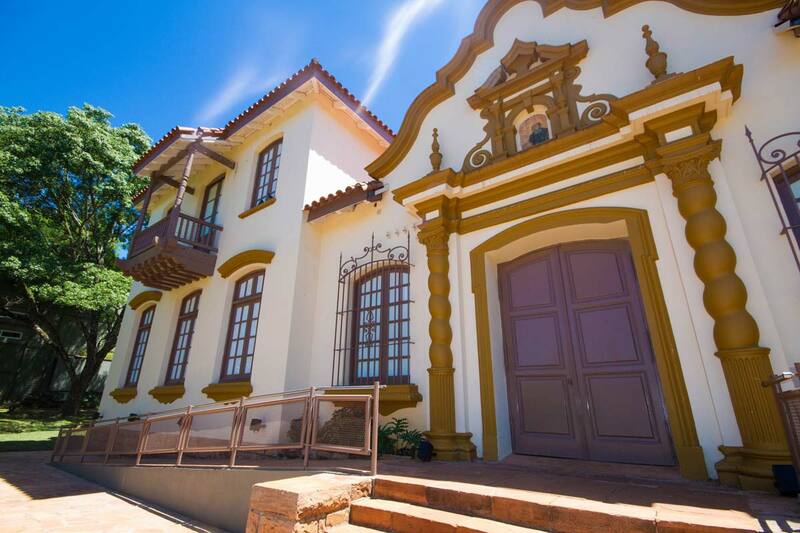 The hotel is a 10 to 15-minute walk to the center of San Ignacio. However, after a long day of exploring, the kids were not in the mood to wait for the very line-ups. Even though the food in town smelled and looked delicious! You can find the best prices and availability of this hotel on Booking.com or click the link below. The room rate included access to wi-fi which we found worked best when we were sitting on the outdoor furniture in front of the cottage. It also comes with free breakfast which consisted of coffee sachets, tea bags, croissants, and an assortment of pastries. The breakfast was brought to our cottage in the morning daily. It would have been nice to have fresh coffee instead of sachets provided. 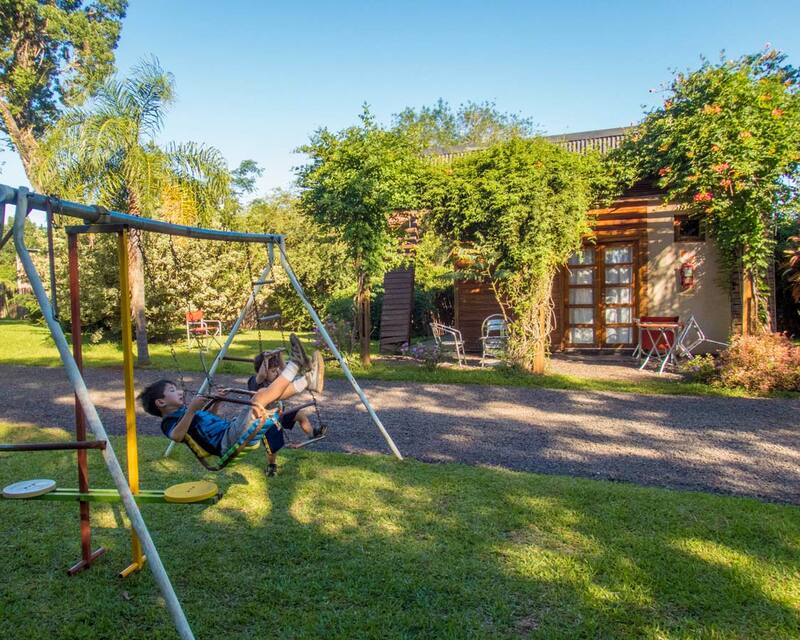 Do We Recommend a Visit to San Ignacio Argentina? Travel to San Ignacio, Argentina was a gamble for our time spent exploring in this country. But we are very glad that we took the chance. The unique perspective into the country’s history and culture was wonderful. And of course, it gave us the opportunity to explore nearby Paraguay, which was a treat in and of its own. Michael at Brizas del Norte is an excellent resource for exploring the surrounding region. And if you need an English speaking guide or simply a ride, ask for Jimmy the Aussie. He was full of incredible information and absolutely wonderful with the boys. I would not be much wrong if I say that you have brought to us a gem of a place. 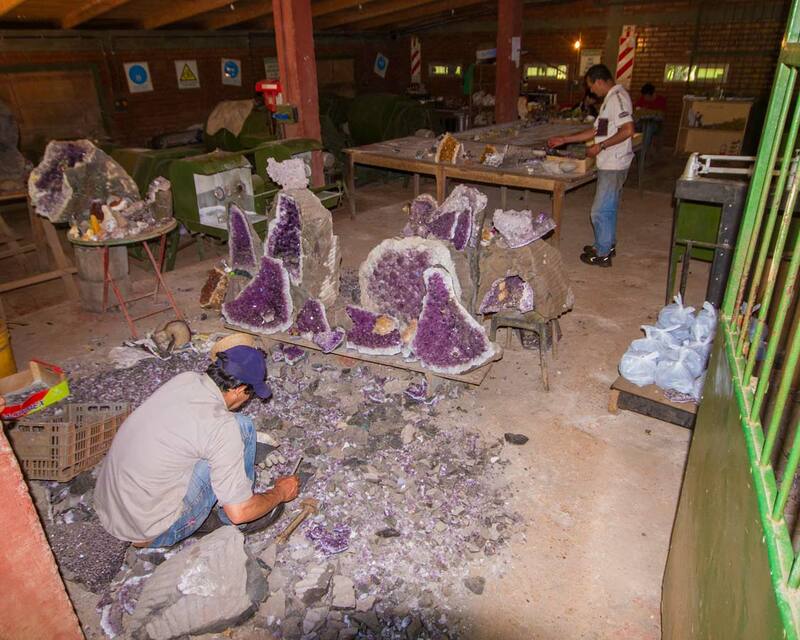 Replete with history, amethyst mining and so on. I am just adding San Ignacio to my list of things to do in South America. We haven’t been to Argentina yet. What time of the year is the best time to visit? Loving the look of the ruins and would love to see them with our kids! Argentina is very long, and stretches from north to south, so the best time to go depends a lot upon where in the country you are planning on going. In the north, you can have tropical temperatures, while in the south, you might be dealing with quite a chill. I love historical places like this! Did you find out why the buildings had changed colour – just due to age I guess? And was it very expensive to enter the San Ignacio ruins, considering you had to pay twice? Also, I think it’s amazing that you got to find crystals! That’s definitely an interesting souvenir! So cool to see you go off the beaten path and discover Argentinian culture that needs to be preserved. However much technology is advancing, we need to treasure Mother Earth and take care of everything she offers us. What a sumptuously photographed and written article! The Wanda Mines are particularly alluring to me, since I love quartz crystals. What a fun tourist attraction! The temperatures in the summer in the Misiones province can reach around 25 degrees Celsius. During the winter months, they can drop to around 15 (June-September) so temperatures are not usually the main factor for visitors. The spring (September – December) tend to be the best months, although they come with a risk of heavy rains. We haven’t been to South America yet, and I feel like we’re going to need a good month to explore when we finally do make it for our first trip. There’s just so much to see and do, like these ruins I hadn’t heard about before. What I’m intrigued by is you said the structure were built from red sandstone, but also that they were originally white. So did you find out how or why they were originally white? Absolutely! Like many colonial Spanish-style buildings, the base building materials had adobe coverings that was used to decorate the stone underneath. Those ruins are quite impressive! Some of them are still standing quite tall. It looks like a great place to explore for the day. The night show is really cool, especially with the display of figures on the mist. I would love to explore this area, I find ruins so fascinating and educational. Whoa, this is awesome. It’s like jumping into the Movie the Mission to see history of the Jesuits & Guarani in South America. The San Ignacio Mission looks amazing and I would love to wander the site especially the night show. That is crazy that those old red sandstone walls were white. Wonder how they got them white? The other minor mission sites look great too. I guess it is because we are from New Orleans but to walk the cemetery would definitely be a highlight for us too. The Jesuit ruins look fascinating guys. I knew little of this region or Argentina for that matter. This region of the world has been elusive to me but I hope to visit within a few years, just to enjoy amazing beauty, fabulous people and some sweet UNESCO sites too. Looks like an amazing trip. The Copan ruins would be so fascinating to see and my kids would the geodes and gems. I love when you can experience indigenous lifestyles too. Such a learning experience for the kids. San Ignacio looks lovely and like there is so much to do. One more reason I’ve got to get myself to Argentina soon! Wow, that’s an amazing super comprehensive guide to San Ignacio in Argentina! Time well spent! Thank you for putting it on my bucket list! Wow, I’ve never heard of these ruins before. Such a detailed overview! Some of the ruins almost look like the smaller temples in Angkor Wat – so interesting to see similarities from around the world. And what a cool experience for your son to have.